Note: This post is based on a presentation that I gave at BA World Sydney on 26th June. It draws from a number of posts that I have written over the last few years. Real-world options often cannot be quantified or rated in a meaningful way. Many of life’s dilemmas fall into this category. For example, a decision to accept or decline a job offer is rarely made on the basis of material gain alone. Even where ratings are possible, they can be highly subjective. For example, when considering a job offer, one candidate may give more importance to financial matters whereas another might consider lifestyle-related matters (flexi-hours, commuting distance etc.) to be paramount. Another complication here is that there may not be enough information to settle the matter conclusively. As an example, investment decisions are often made on the basis of quantitative information that is based on questionable assumptions. Finally, the problem may be wicked – i.e. complex, multi-faceted and difficult to analyse using formal decision making methods. Classic examples of wicked problems are climate change (so much so, that some say it is not even a problem) and city / town planning. Such problems cannot be forced into formal decision analysis frameworks in any meaningful way. The main theme running through all of these is uncertainty. Most of the decisions we are called upon to make in our professional lives are fraught with uncertainty – it is what makes it hard to rate options, adds to the subjectivity of ratings (where they are possible) and magnifies the wickedness of the issue. The most important decisions in a project are generally made at the start, at what is sometimes called the “front-end of projects”. Unfortunately this is where information availability is at its lowest and, consequently, uncertainty at its highest. In such situations, decision makers feel that they are left with little choice but to base their decisions on instinct or intuition. Now, even when one bases a decision on intuition, there is some deliberation involved – one thinks things through and weighs up options in some qualitative way. Unfortunately, in most situations, this is done in an unsystematic manner. Moreover, decision makers fail to record the informal reasoning behind their decisions. As a result the rationale behind decisions made remain opaque to those who want to understand why particular choices were made. Clearly, what one needs is a means to make the informal reasoning behind a decision explicit. Now there are a number of argument visualisation techniques available for this purpose, but I will focus on one that I have worked with for a while: Issue-Based Information System (IBIS). I will introduce the notation briefly below. Those who want a detailed introduction will find one in my article entitled, The what and whence of issue-based information systems. Issues (or questions): these are issues that need to be addressed. Positions (or ideas): these are responses to questions. Typically the set of ideas that respond to an issue represents the spectrum of perspectives on the issue. Arguments: these can be Pros (arguments supporting) or Cons (arguments against) an issue. The complete set of arguments that respond to an idea represents the multiplicity of viewpoints on it. The best IBIS mapping tool is Compendium – it can be downloaded here. In Compendium, the IBIS elements described above are represented as nodes as shown in Figure 1: issues are represented by green question nodes; positions by yellow light bulbs; pros by green + signs and cons by red – signs. Compendium supports a few other node types, but these are not part of the core IBIS notation. Nodes can be linked only in ways specified by the IBIS grammar as I discuss next. 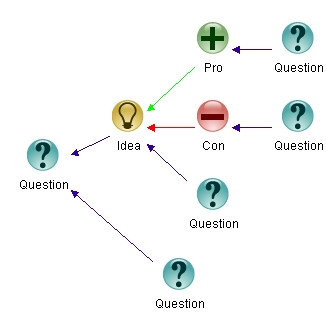 Ideas can only respond to questions – i.e. in Compendium “light bulb” nodes can only link to question nodes. The arrow pointing from the idea to the question depicts the “responds to” relationship. See or this post or this one for examples of IBIS in mapping dialogue. See this post or this one for examples of argument visualisation (issue mapping) using IBIS. In my talk, I illustrated the use of IBIS by going through a couple of examples in detail, both of which I have described in detail in other articles. Rather than reproduce them here, I will provide links to the original sources below. The first example was drawn from a dialogue mapping exercise I did for a data warehousing project. A detailed discussion of the context and process of mapping (along with figures of the map as it developed) are available in a paper entitled, Mapping project dialogues using IBIS – a case study and some reflections (PDF). The second example, in which I described a light-hearted example of the use of IBIS in a non-work setting, is discussed in my post, What should I do now – a bedtime story about dialogue mapping. The case studies serve to highlight how IBIS encourages collective deliberation of issues. Since the issues we struggle with in projects often have elements of wickedness, eliciting opinions from a group through dialogue improves our chances arriving at a “solution” that is acceptable to the group as a whole. Is a common point of reference to move a discussion forward. Further still, IBIS disarms disruptive discussion tactics such as “death by repetition” – when a person brings up the same issue over and over again in a million and one different ways. In such situations the mapper simply points to the already captured issue and asks the person if they want to add anything to it. The disruptive behaviour becomes evident to all participants (including the offender). The beauty of IBIS lies in its simplicity. It is easy to learn – four nodes with a very simple grammar. Moreover, participants don’t need to learn the notation. I have found that most people can understand what’s going on within a few minutes with just a few simple pointers from the mapper. Another nice feature of IBIS is that it is methodology-neutral. Whatever your methodological persuasion – be it Agile or something that’s BOKsed – you can use it to address decision problems in your project meetings. The best way to learn IBIS is to map out the logic of articles in newspapers, magazines or even professional journals. Once you are familiar with the syntax and grammar, you can graduate to one-on-one conversations, and from there to small meetings. When using it in a meeting for the first time, tell the participants that you are simply taking notes. If things start to work well – i.e. if you are mapping the conversation successfully – the group will start interacting with the map, using it as a basis for their reasoning and as a means to move the dialogue forward. Once you get to this point, you are where you want to be – you are mapping the logic of the conversation. Of course, there is much more to it than I’ve mentioned above. Check out the references at the end of this piece for more information on mapping dialogues using IBIS. As this post is essentially covers a talk I gave at a conference, I would like to wrap up with a couple of observations and comments from the audience. I began my talk with the line, “A central myth about decision making in organisations is that it is a rational process.” I thought many in the audience would disagree. To my surprise, however, there was almost unanimous agreement! The points I made about uncertainty and problem wickedness also seemed to resonate. There were some great examples from the audience on wicked problems in IT – a particularly memorable one about an infrastructure project (which one would normally not think of as particularly wicked) displaying elements of wickedness soon after it was started. Paul Culmsee & Kailash Awati, The Heretic’s Guide to Best Practices: The Reality of Managing Complex Problems in Organisations, iUniverse: Bloomington, Indiana (2011). Work commitments have conspired to keep this post short. Well, short compared to my usual long-winded essays at any rate. Among other things, I’m currently helping get a biggish project started while also trying to finish my current writing commitments in whatever little free time I have. Fortunately, I have a ready-made topic to write about this week: my recently published paper on the use of dialogue mapping in project management. Instead of summarizing the paper, as I usually do in my paper reviews, I’ll simply present some background to the paper and describe, in brief, my rationale for writing it. 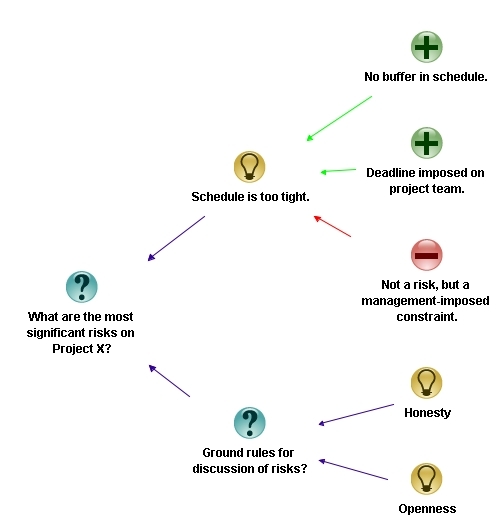 Most knowledge management efforts on projects focus on capturing what or how rather than why. That is, they focus on documenting approaches and procedures rather than the reasons behind them. 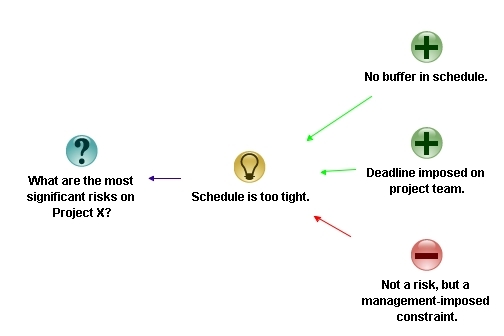 This often leads to a situation where folks working on subsequent projects (or even the same project!) are left wondering why a particular technique or approach was favoured over others. 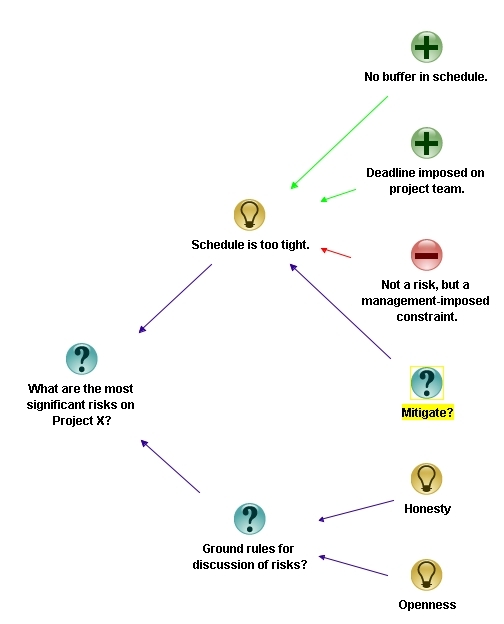 How often have you as a project manager asked yourself questions like the following when browsing through a project archive? Why did project decision-makers choose to co-develop the system rather than build it in-house or outsource it? Why did the developer responsible for a module use this approach rather than that one? More often than not, project archives are silent on such matters because the reasoning behind decisions isn’t documented. In this post I discuss how the Issue Based Information System (IBIS) notation can be used to fill this “rationale gap” by capturing the reasoning behind project decisions. Note: Those unfamiliar with IBIS may want to have a browse of my post on entitled what and whence of issue-based information systems for a quick introduction to the notation and its uses. I also recommend downloading and installing Compendium, a free software tool that can be used to create IBIS maps. Example 1: Build or outsource? 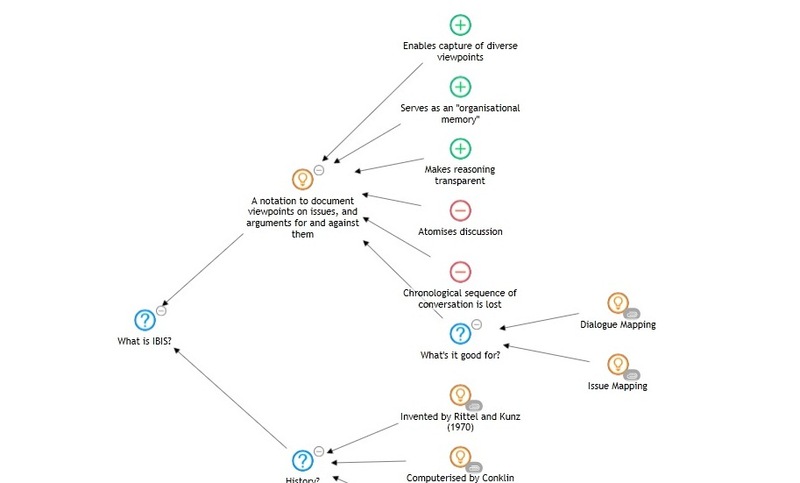 In a post entitled The Approach: A dialogue mapping story, I presented a fictitious account of how a project team member constructed an IBIS map of a project discussion (Note: dialogue mapping refers to the art of mapping conversations as they occur). The issue under discussion was the approach that should be used to build a system. Co-develop using a mix of external and internal staff. Must be within a specified budget. Must implement all features that have been marked as top priority. The post details how the discussion was mapped in real-time. Here I’ll simply show the final map of the discussion (see Figure 1). Although the option chosen by the group is not marked (they chose to co-develop), the figure describes the pros and cons of each approach (and elaborations of these) in a clear and easy-to-understand manner. 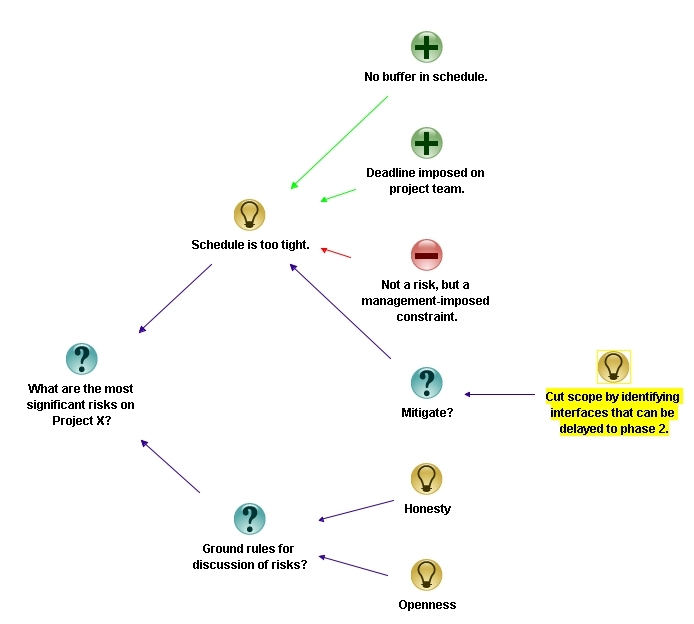 In other words, it maps the rationale behind the decision – a person looking at the map can get a sense for why the team chose to co-develop rather than use any of the other approaches. 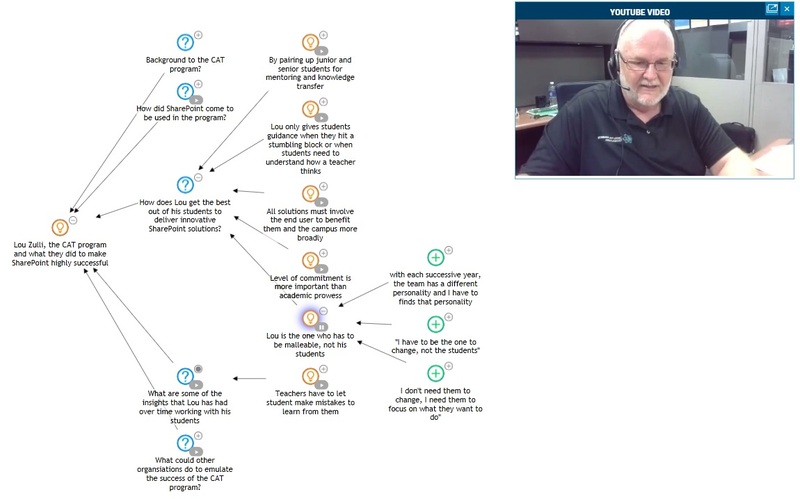 In another post on dialogue mapping I described how IBIS was used to map a technical discussion about the best way to update selected tables in a data mart during business hours. For readers who are unfamiliar with the term: data marts are databases that are (generally) used purely for reporting and analysis. They are typically updated via batch processes that are run outside of normal business hours. The requirement to do real-time updates arose from a business need to see up-to-the-minute reports at specified times during the financial year. Again, I’ll refer the reader to the post for details, and simply present the final map (see Figure 2). Figure 2: IBIS Map for Example 2. Use our messaging infrastructure to carry out the update. Write database triggers on transaction tables. These triggers would update the data mart tables directly or indirectly. Write custom T-SQL procedures (or an SSIS package) to carry out the update (the database is SQL Server 2005). Run the relevant (already existing) Extract, Transform, Load (ETL) procedures at more frequent intervals – possibly several times during the day. 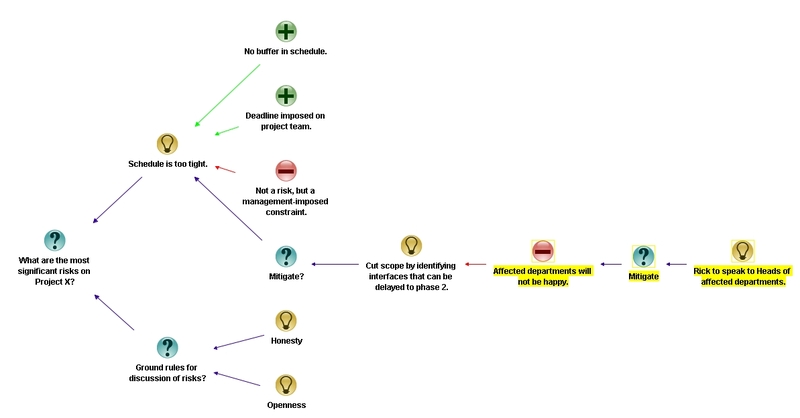 In this map the option chosen by the group decision is marked out – it was decided that no additional development was needed; the “real-time” requirement could be satisfied simply by running existing update procedures during business hours (option 4 listed above). Once again, the reasoning behind the decision is easy to see: the option chosen offered the simplest and quickest way to satisfy the business requirement, even though the update was not really done in real-time. Making explicit all the options considered. Describing the pros and cons of each option (and elaborations thereof). Providing a means to explicitly tag an option as a decision. Optionally, providing a means to link out to external source (documents, spreadsheets, urls). In the second example I could have added clickable references to documents elaborating on technical detail using the external link capability of Compendium. 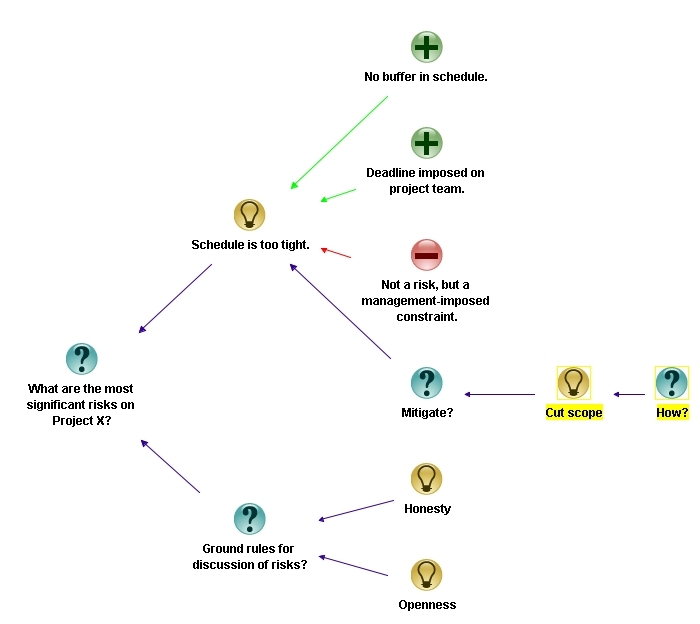 Issue maps (as IBIS maps are sometimes called) lay out the reasoning behind decisions in a visual, easy-to-understand way. The visual aspect is important – see this post for more on why visual representations of reasoning are more effective than prose. 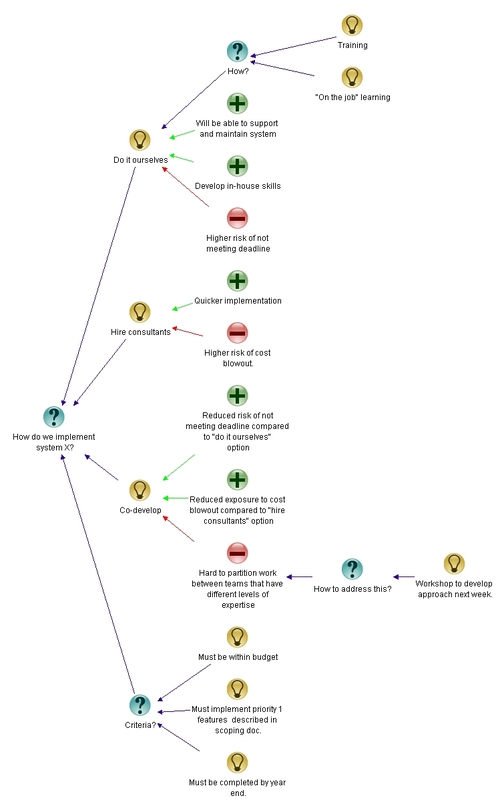 I’ve used IBIS to map discussions ranging from project approaches to mathematical model building, and have found them to be invaluable when asked questions about why things were done in a certain way. 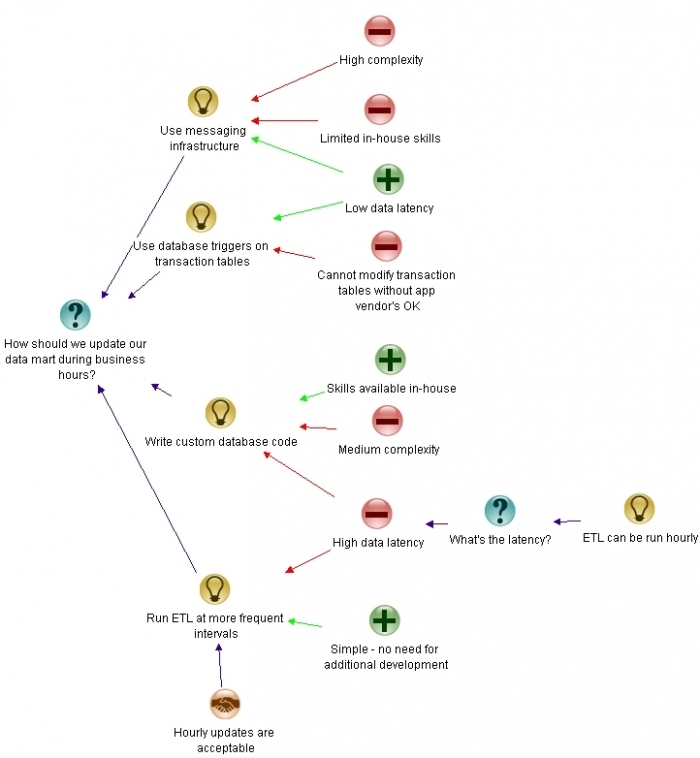 Just last week, I was able to answer a question about variables used in a market segmentation model that I built almost two years ago – simply by referring back to the issue map of the discussion and the notes I had made in it. In summary: IBIS provides a means to capture decision rationale in a visual and easy-to-understand way, something that is hard to do using other means.